Winter isn’t renowned for its upfront displays of brilliant flowers. I remember Christopher Lloyd opining that ‘the great thing about the garden at this time of year is that nobody expects anything of it’. cocca confusa. It’s a modest-sized evergreen with leaves rather like a very glossy privet and slightly narrower. Growing on Hampshire chalk, the foliage on my plants is inclined to be on the yellow side of green, although never so chlorotic as to make me feel that I should put it out of its misery and give it to a friend with more acidic earth. Occasional helpings of sequestered iron seem to perk it up. Aside from the fact that it makes a good, low, informal hedge, it is the white and whiskery flowers that make Sarcococca so welcome in any garden. They open in December and carry on through January, scenting the air for yards around. I love it when visitors walking in the garden detect its powerful, dolly-mixture sweetness three or four paces after they’ve passed the plant. 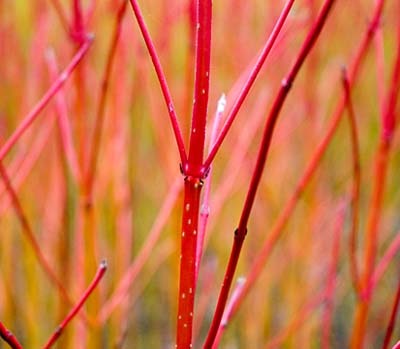 Red-stemmed dogwoods Cornus alba Sibirica and the pink-and-orange Cornus sanguinea Midwinter Fire are wonderfully cheery when their leaves have fallen, especially when the stems are reflected in the still water of a lake or pond. That is undoubtedly the best place for them. Cutting them hard back to within a few inches of the ground in spring, as is often recommended, will sometimes be too much for them to cope with, unless the soil is especially damp and enriched with well-rotted manure or garden compost. It is the young stems that are the most colourful and which offer the most spectacle, so they do need to be encouraged and the older ones cut out. I find that chopping down half of the stems on each plant to within 3in of the ground in one year, and the other half the following year, is the best solution-the shrub isn’t then made to suffer too much in one hit and will invariably rally come spring. But that’s some while off-we will doubtless have much more of ‘bleak midwinter’ to come before buds begin to burst. No one can be high-spirited on those days when the sky is the colour of an army blanket and dusk begins to fall in mid-afternoon, but hard winters have a cauterising effect that we tell ourselves is good at polishing off pests and diseases-although I wonder, sometimes, how much of this is wishful thinking. In the meantime, it’s impossible to overestimate the value of feeding the birds now-not just with shelled peanuts, but with seed mixes, balls of seed-laced suet and that fine black nyjer seed that, when dispensed via a special fine-holed feeding cylinder, will attract charms of goldfinches quite quickly. For blackbirds, robins and other ground feeders, the seed needs to be scattered on the lawn well clear of shrubberies that might allow cats a place to lie in wait. Even with masses of berries in the garden, these extra food supplies are vital and untidiness is often repaid-windfall apples left on the ground to rot will encourage fieldfares and redwings that have come south from Scandinavia. Fresh water each morning, and regular cleaning of the feeders (once a week with diluted detergent) helps maintain bird health-green-finches in particular are prone to a malaise transmitted by dirty seed dispensers. The cost of all this provision is not inconsiderable in a large garden, but you’ll be amply recompensed by the entertainment on offer at a time when floral treats are thin on the ground.